Mareks Mitens earned the first shutout of his Laker career in a 2-0 win over Bemidji State. Coupled with a shutout the previous night, it was the first time since 2010 that the Lakers blanked an opponent twice in one weekend (Mike Barrett/LHB). 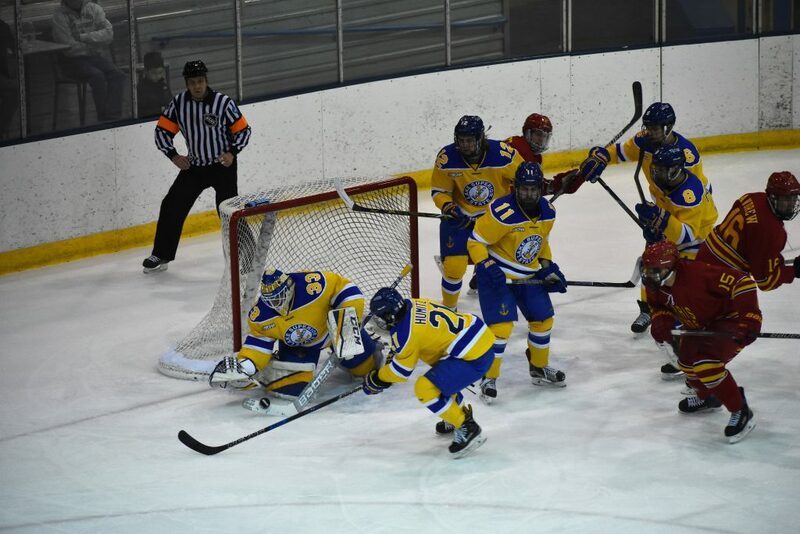 BEMIDJI, Minn. – Looking for their first sweep of the season, the Lake Superior State Lakers made a rather unconventional move in net. 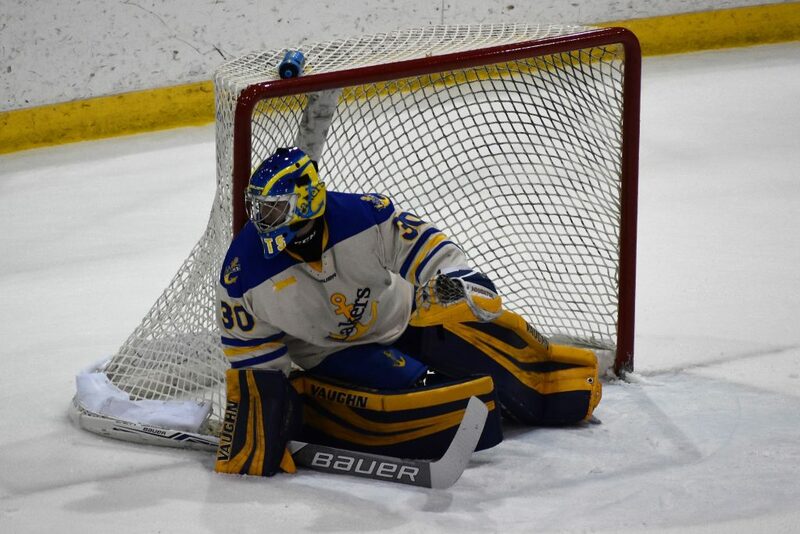 A night after Nick Kossoff picked up the first shutout for the Lakers in nearly two seasons, Freshman Mareks Mitens got the nod from head coach Damon Whitten. The native of Ventspils, Latvia, showed he was equal to the task, stopping all 36 shots, as the Lakers (8-20-4, 6-15-3 WCHA) posted back to back 2-0 shutouts of Bemidji State in a series sweep. With the win, the Lakers are hoping to propel themselves back into playoff positioning. Coming into the game, they trailed the Alaska Nanooks by 8 points, as the Nanooks, like the Lakers, won the night before. The opening period had the Beavers (14-10-6, 11-7-4-2 WCHA) swarming, outshooting the Lakers 13-3. Mitens was sharp throughout, as the game remained scoreless after 20 minutes. Max Humitz got Lake Superior on the board with a goal on a delayed penalty to BSU’s Adam Brody. Humitz redirected a puck past Beavers goaltender Michael Bitzer for a 1-0 lead. Picking up assists on Humitz’s goal were Collin Saccoman and Yuki Miura. For Miura, it was his first point as a Laker. Down a goal going into the final stanza, Bemidji State continued peppering Mitens with shots. The freshman continued turning away shot after shot. The Beavers appeared to tie the game when Aaron Miller drilled a puck past Mitens. Upon further review, however, it was ruled that Mitens had been interfered with on the play, thus negating the goal. Like last night, Bemidji State took an untimely penalty late, as Myles Fitzgerald was called for tripping with just 2:15 to play. Rolling the dice, coach Tom Serratore pulled Bitzer, evening up the skaters. After a couple of long shots missed the net and iced the puck, Diego Cuglietta iced the game away with an empty netter at the 19:38 mark, sealing the Lakers’ fate. The last time Lake Superior had back to back shutouts was in the 2012-13 season. Kevin Murdock shut out Northern Michigan in the final game of the regular, followed by Kevin Kapalka shutting out Bowling Green in the first game of the CCHA Conference Tournament. To find the last time the Lakers were not scored upon in a series, one must go back to November of 2010. Kevin Kapalka had back to back blanking of Ferris State on 12th and 13th of that month. Nick Kossoff (pictured here against Ferris State) earned the fourth shutout of his Laker career in a 2-0 win over Bemidji State (Mike Barrett/LHB). 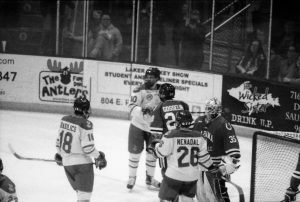 BEMIDJI, Minn. – Playing their final six games of the season on the road, the Lake Superior State Lakers would need to find a way to win on the road in order to have any shot at a WCHA playoff berth. Whitten’s club took a step in the right direction, as the Lakers (7-20-4, 5-15-3 WCHA) blanked Bemidji State (14-9-6, 11-6-4 WCHA) 2-0 on Friday night. Lake Superior came out strong in the first period, holding a 12-7 edge in shots on net. J.T. Henke opened the scoring when he notched his 9th goal of the season. Assisted by Bryan Basilico and Kyle Chatham, the Trenton, Michigan native put the puck behind Beavers goaltender Michael Bitzer for a 1-0 lead. In the second period, Bemidji State began clamping down on the Laker offense, limiting them to just four shots. The Beavers, while getting eight shots of their own, were still being stymied by the Lake State blueliners. An odd man rush helped Anthony Nellis widen the Lakers lead to 2-0 with his 10th of the season. The final period saw the Beavers begin to successfully generate more shots on net than before. Despite seeing more rubber, Lakers netminder Nick Kossoff could not be beat. Pulling Bitzer for an extra skater, Bemidji looked to get back in the game with under three minutes to play. Lake State’s Gage Torrel, who assisted on the Nellis goal, got the puck and attempted to ice the game away; Dillon Eichstadt took him down from behind. While Eichstadt’s actions likely saved a goal, it essentially negated the action of pulling Bitzer. Forced to kill a minor penalty late in the game, the Beavers could not get any good chances on Kossoff, as the Lakers prevailed on the road by a 2-0 final score. By stopping all 28 shots, Kossoff picked up his first shutout of the season, and the fourth of his career. His last shutout came on December 30, 2015 againt Brown in the Catamount Cup. In addition, it was the first shutout for a Laker goaltender since Gordie Defiel shutout Minnesota State in Game 2 of the 2016 WCHA Quarterfinals. Across the ice, Bitzer came up with 18 saves on 20 shots. Neither team took advantage of their power play opportunites, as the Lakers were 0 for 4, while Bemidji was 0 for 1. A slashing penalty to Jake Hand was the only power play the Beavers were afforded.